Very beautiful theme. Is clear and fits my needs and has vice colors. 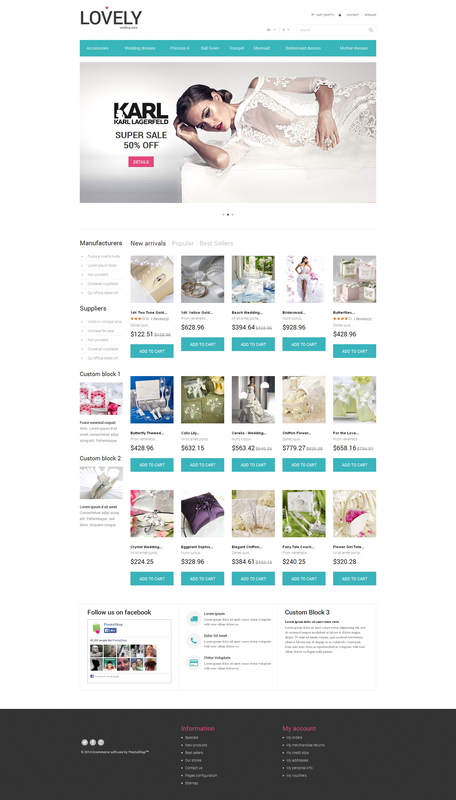 Aptly named, Lovely is a responsive Wedding PrestaShop Theme with clean design, modern look, and profound functionality. Its minimalist background allows you to easily apply it to gift, flower, or beauty stores as well. In the top of the template there is a sticky menu bar with mega menu functionality, which lets you use images and videos along with text links. This theme supports the full-featured quick view pop-ups with image galleries and social sharing buttons. It is also supplied with a live chat extension by Olark, which enables you to provide high-quality support to your customers, and 4 color schemes to choose from. Хорошая тема для магазина. Легкий дизайн и адаптивная система. Спасибо разработчикам за хорошую работу!!! Устанавливается отлично без сбоев, все картинки на месте. Интернет магазин с таким шаблоном будет смотреться очень красиво!